Missing someone you love for whatever reason is always hard to endure. For some it is even more challenging and cuts even deeper to be without someone they care for. Missing people is a part of life, some people simply cope with these feelings better than others. 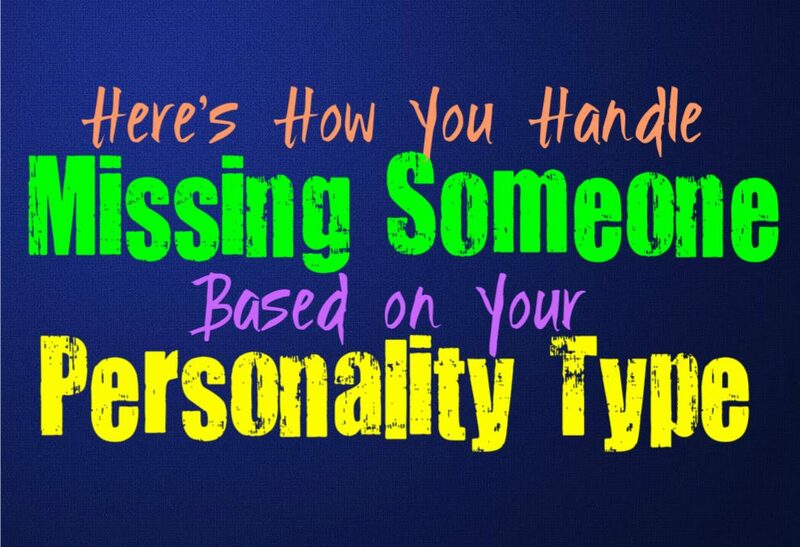 Here is how you handle missing someone, based on your personality type. For INFJs missing someone isn’t always a painful thing, it is about the emotional distance between them. If they are physical separated from a loved one for a while, they can handle this fairly well as long as they still feel intimate and emotionally connected to them. INFJs don’t mind being alone most of the time, they don’t need to constantly be near someone in order to feel connected to them. If they are missing someone because they are no longer in their lives or they feel distant from them emotionally, then the INFJ will take this harshly. This type of pain is something that stays with them forever in some ways, especially if the person did nothing to intentionally hurt the INFJ. ENFJs can struggle when they are missing someone they love, especially if they feel truly distant from them emotionally. They want to feel close to their loved ones and enjoy connecting with them as much as they can. ENFJs don’t mind being separated from someone for a short time, but in most situations it can be painful for them. They don’t like having to miss someone, and would much rather be building on their closeness and relationship in a way that makes them feel like they don’t have to miss one another. INFPs don’t mind the feeling of missing someone they love, especially if they still are emotionally close to that person. Being separated physically isn’t always the worst thing for INFPs, and can sometimes even grow that bond in a deeper way. They don’t mind the feeling of missing someone as long as they think of another fondly, and still feel connected in an emotional and spiritual manner. Sometimes missing someone can be a good thing, since it helps give them time to process their inner emotions and come to realize just how deep those feelings are. ENFPs can sometimes struggle with the feelings of missing someone, and they often feel saddened by this. They want to be around the people they love, and don’t like having to miss them for too long. A little time missing someone isn’t horrible for them, since they do enjoy being able to process their feelings and realize how much they truly care. ENFPs simply don’t want to have to miss someone for too long, and can become a bit depressed when they are separated from the people they feel deeply connected to. They feel things so deeply, and don’t want to lose those connections. INTJs often don’t mind missing someone, since they enjoy being on their own most of the time. If they care about someone that does not simply go away because they are separated, and they often have that person in their thoughts. As long as the INTJ feels connected to someone and committed to them, the distance does not matter. They don’t become upset simply because they miss someone, and often enjoy this time to be away from one another and fully process how they feel about them. INTJs are unlikely to miss someone who is no longer in their lives by choice, and are good at moving on from those situations. ENTJs don’t mind missing people, as long as they are committed to them and feel that commitment reciprocated. ENTJs don’t need to be around their loved ones constantly in order to feel connected to them. They are hardworking people and often have plenty of other things in their life that they need to focus on. While ENTJs might be doing something else, that doesn’t mean they don’t still have the people they love in the back of their minds. They don’t mind missing someone for short periods of time, but after a while they do prefer to have them near. INTPs don’t mind missing people for a short time, since they do enjoy being on their own. Having the chance to miss someone really helps them feel closer, especially if they can entirely trust those people and that their feelings are reciprocated. INTPs don’t mind missing people who are still in their lives, and enjoy the chance to process their feelings away from one another. Where the INTP can become bothered by missing someone, is if they feel emotionally distant from that person. These feelings can be painful for them, and they internalize them in a way that most people don’t fully recognize from the outside. ENTPs don’t mind missing people for a little while, but eventually this can wear on them. For the ENTP it entirely depends on who the person is and what their place in their life is meant to be. If they are missing friends or family members, they can often cope with this and simply make contact in order to feel close to them again. ENTPs don’t like having to miss someone they are romantically involved with, especially if this goes on for a long time. They want to remain close to that special person, and eventually become frustrated not being able to share things with them in person. ISTJs don’t mind missing people for a little while, and might enjoy having this time to process their thoughts and feelings about them. Being away from people they love for a short time isn’t so bad, since ISTJs do require plenty of alone time in order to recharge. They don’t want to miss someone for a long time though, and can become upset if they are separated from someone they care for. They want to be able to protect and provide for their loved ones, and distance can prevent this. ESTJs actually struggle more than people realize when they are missing someone they love. ESTJs can seem stern and hard on the outside, but most of the time they care deeply for the ones they love. When the ESTJ cares about someone it hurts them to be away from that person, even though they might have a hard time expressing this. While they don’t easily show their feelings, they do feel them deeply. ESTJs don’t want to miss someone they love, instead they want to keep them close. ISFJs really don’t like missing someone they love, and can become very unhappy with this. When the ISFJ considers someone to be in their family or close circle, they don’t want to have to miss them. They want to keep their loved ones close to them, and enjoy being able to hear from them often. Missing people who are important to them, can truly upset the ISFJ and leave them feeling a bit lost in their lives. The most important thing to them is their family and loved ones, and so they don’t want to have to miss them. ESFJs truly dislike missing people they love, and this often weighs heavily on them. They want to be able to feel close to the people they care for, and don’t like being distant from them. When they are missing a loved ones it can be painful for the ESFJ, and can cause them to seem distracted and even annoyed. They love with their whole hearts, and become truly depressed when they are missing someone who is important to them. ISTPs don’t mind missing people, and often enjoy being able to experience this emotion. When they miss someone it helps them recognize their feelings for them, and gives them space to process this. ISTPs also need plenty of time alone, and just because they are away from someone it does not mean they aren’t thinking about them. ISTPs want relationships where they are allowed to miss one another, without feeling like they are actually distant from each other. ESTPs don’t mind missing people sometimes, as long as they feel emotionally connected to them. They can become uneasy when they miss someone who they believe does not miss them in return, and this can cause them to feel unhappy. They sometimes have a desire to chase after these people who are distant from them, and take it as a bit of a challenge. ESTPs care about those closest to them, and while they don’t always show this outwardly, they want to feel connected to them. ISFPs feel things very deeply, and because of this they are very pained when they miss someone close to them. Being separated from someone they love can affect the ISFP immensely, causing them to retreat inward. They will want to feel close to that person, and will do their best to keep the connection even if they are apart. ISFPs have such strong inner emotions that it can be challenging sometimes for them to contain these feelings.